In St. Therese Lisieux's "Little Way" she shows a "HUGE" devotion to the Sacred Heart. Her life may have been very simple and humble but, her love for Our Lord was enormous. She is my favorite saint. I admire her immensely and she has touched my heart in a very special way. 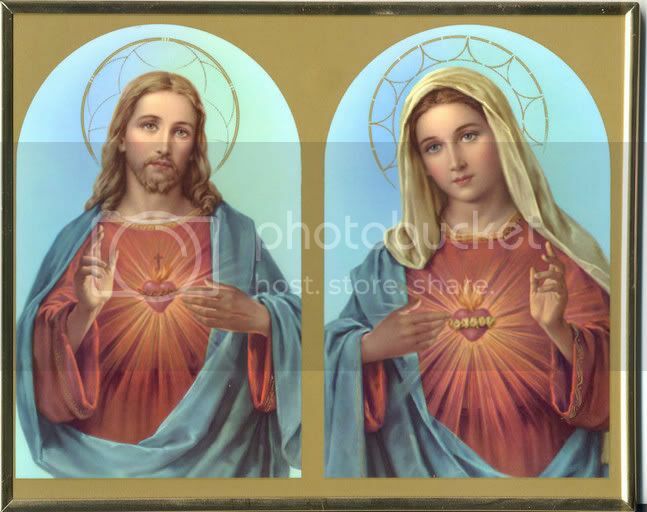 She brought me closer to The Sacred Heart of Jesus through our Blessed Mother's Immaculate Heart. FROM: "THE STORY OF A SOUL"
Not even you, Archangels heaven assigned! And bear His lifeless body far away. Unless God's Face shall greet my longing eyes." To Thee each deep desire of mine is known. To make of worth my life's long sacrifice. I know it well, the soul must pass through fires. The flaming love of Thy great Heart's desires! O Little Flower of Jesus, ever consoling troubled souls with heavenly graces, in your unfailing intercession I place my trust. From the Heart of Our Blessed Savior petition these blessing of which I stand in greatest need (mention here). Shower upon me your promised roses of virtue and grace, dear Saint Therese, so that swiftly advancing in sanctity and in perfect love of neighbor, I may someday receive the crown of eternal life. Amen. LITTLE WAY TO GOD - ST. THERESE OF LISIEUX AND THE SACRED HEART, by Gaston Roberge, S.J., Gujart Sahiya Prakash - Anand, India, 1984.